Jethro Tull — The Rock Opera, a new show inspired by a trip that the prog rock band’s frontman Ian Anderson took to Italy, features a quasi-operatic structure with virtual guests on video and some additional newly written songs to round off the elements of the story. The band revisits hits such as “Aqualung,” “Living in the Past,” “Wind-Up,” “A New Day Yesterday,” “The Witch’s Promise,” “Locomotive Breath” and other favorites, adding slightly re-written lyrics. Anderson phoned us from his UK home to discuss the tour. On your website, you have a list of frequently asked questions. Which one of them do you find the most annoying? Oh, there’s nothing really particularly annoying. I suppose if you’re doing print media, then those are things that people can easily copy and paste. It will save them time. If it’s radio or television, you have to be prepared to answer the questions again and again and again. “How did you get the name Jethro Tull?” is always the most common. But “When did you discover you weren’t gay?” I don’t get asked at all, which is a bit worrying. I suspect people assume that I’m a man’s man or perhaps they think I’m a girlie flute player. I’m not sure which. I don’t get that ever, except once in Australia when I went there in 1972. No one ever asks me about my sexual proclivities. Despite your disdain for the questions, your answers are rather revealing. I like the fact that you acknowledge the loyalty of your fans as a key to the band’s longevity. For all artists, that’s what it’s about. For those that don’t enjoy that longevity in the longer term, they enjoy the fickle interests of those who move on to the next thing. For us, Japan was a bit like that. We never engendered ourselves to the young generation there. If you didn’t go back and play on a regular basis in Japan, you tended to be forgotten. That’s just my experience. I’m sure there are other artists they are loyal to. We started out well in Japan but it fizzed because we didn’t go back regularly enough so there wasn’t a big turnout when we did go back a few years later. They’ve grown up and left us behind. What was it that first made you want to pick up the flute? The flute was really an accident. It wasn’t a dedicated, thought-through career choice. It was a frivolous impulse buy. I decided not to continue being the guitar player. I decided to get rid of my old, probably rather valuable, Fender Strat and they wouldn’t give me money for it. They would allow me to exchange it for something else. I knew I wanted a microphone. I coveted a microphone that was the one you saw professionals using, which was the forerunner to the Shure SM57, which is the one you see people using to this day. The predecessor was the Unidyne III. I got one of those for the balance of the guitar. I picked the flute, which was hanging on the wall the music store. I liked it because it was small and shiny and not the sort of thing that you saw everyday in the world of pop and rock music. More importantly, Eric Clapton and Jimi Hendrix didn’t play it so I thought it was a good choice. And why did you think it could work in the context of a rock band? Not straight away, that’s for sure. I got it in the summer of 1967 and didn’t get a note out of it until December. I got a few notes and managed to join things together and by January of 1968 was playing simple passages and by February when Jethro Tull became Jethro Tull and we became playing at the Marquee Club, that’s when I was noticed as the flute player and I tried to give it a role that was equal to the guitar. I didn’t want it to be decorative addition in the way the flute sometimes did appear in pop music. I wanted it to more dominant and aggressive instrument. It became a guitar substitute. I was thinking guitar but playing the flute. Did the flute ever catch on? The only bands that I remember featuring the flute were maybe King Crimson. I think the sax player played some flute. I know Chris Wood in Traffic was a sax player who doubled playing flute. There was also a flute player in the Moody Blues. He didn’t play an enormous amount. It cropped up here and there, but I felt like I was the guy carving out that niche. Apparently, other people did, too, because they stayed away from it. There were a few bands who introduced it prior to that. Even Peter Gabriel played flute in early Genesis but wisely decided to leave that up to me and I wisely decided to leave dressing as a giant sunflower up to him. 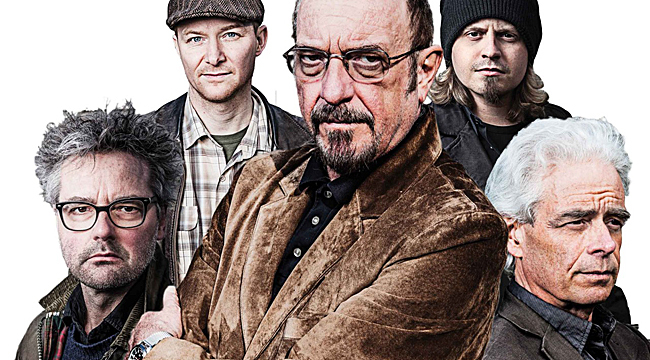 Talk about the current project, Jethro Tull: A Rock Opera. When did the idea first come to you? Do fans need to know all that to get something out of the current tour? I have to make a show that is entertaining for those who even don’t know or can’t be bothered. It’s got to work for the toe-tappers and those who want to hear the best of Jethro Tull. There are five mercifully short songs that help to tell the story but the bulk of the set are songs that are the most widely known of the Jethro Tull repertoire. I’ve delivered songs with a big video screen and virtual guests and it has to work as a piece of entertainment. But, just as when you go to the ballet, it might be good to know a bit about what you plan to see. Things can be less than obvious if you go to an opera or ballet. You can go to JethroTull.com/synopsis and you can read about it in a variety of languages. You can do homework if you want. I’m not here to preach or tell people what they should believe. I present songs and give a little question mark here and there. Your songs often provide social commentary. I feel like the critique of organized religion is as relevant today as it was when the songs originally came out. I’m one of those songwriters who prefers to write about stuff. If I just write about me and how my baby done left me, I think we’ve heard all that before by people who have done it far better than I could ever do it. I tend to steer clear of the common subjects of song lyrics. It’s been done and done again. I chose, as I have done most of my life, subjects that, though sometimes they’re told from a personal standpoint, are ones that people can relate to from their own experiences and imaginations. I write about stuff. I write about difficult stuff sometimes. Novels stand the test of time too. That’s the thing about good movies and good books and television dramas. They work in another age and perhaps live on through generations. You could say that about the Beatles and Rolling Stones and Mozart and Muddy Waters. We see around us many examples of creativity that have been multi-generational in their impact. I think that’s the case too with classic movies. Every year, people still tune in and watch the Sound of Bloody Music and Mary Bloody Poppins and they love it, even though it has this gory Technicolor look about it. People love it because it’s a great story and delivered with the kind of panache you can only do at a certain time. It would be unthinkable to make that kind of entertainment today but we view it in a historical context and we enjoy it even though it might look a little dated. Just as music might sound a little dated, it doesn’t stop our enjoyment of it. I’m happy to join the creative throng that have preceded me.